The discovery of archaeological relics is a testament that men have been using tin for almost 4000 years. In prehistorical times tin was combined with copper in a metal alloy, to produce bronze. The ancient and widespread use of tin is confirmed by the way it was traded, first around areas of Asia, later, when Phoenicians took control of the seas, this extended along Spanish and French coasts, to the Islands of the North Sea. Phoenician traders, followed by the Romans, found areas rich in tin on the Isle of Wight, near St. Austell, and in the hills of Cornwall (Britannia) which they extracted and exported to other countries. Even though the use of tin was limited, it was traded in France, Spain and Etruria. Until the XI century tin wasn't widely used due to the migration of German clans and the associated conflicts. Until this point, it was mainly used for religious purposes as prescribed by the Council of Reims (813), along with gold and silver, in order to produce religious items. As clans took up fixed residence, the use of tin increased with the production of plates, bowls, jugs and glasses. With the production of tableware, wood and clay started to be replaced by tin, a more durable material, and around 1200, handcraft metalworking started to develop in main settlements. Cassiterite has been the chief tin ore throughout ancient history and it takes its name from the Cassiteriti Islands, thought to be the Islands of Scilly, off the southwest of Cornwall. This silvery grey metal is mainly found in underground ore deposits, bound with other minerals, but it is also found in the sand as placer deposits. As an element, tin is rare and it is said to be first extracted in Central Asia. The extraction of it in south-west Britannia was described by Diodoro, Caesar’s contemporary: “Miles and miles of galleries under the sea, and above, on miners’ heads, waves roared”. In the highland parts of these areas, tin was found and extracted in the open. The metal was melted on the spot and sent to Marseille, Bruges and Köln across the Channel. Despite the discovery in 1240 of plentiful tin deposits in the so-called Ore Mountains of Germany, the trade of tin from Britain to the mainland had started to increase by 1347, when the Prince of Wales “handed over all tin mines to the German Tiderman Limbergh for 3 years and 3 months, leaving him the right to corner all the tin of Cornwall and Devonshire”. While tin extraction itself wasn’t a difficult process, separating it from the other minerals present, was quite laborious. 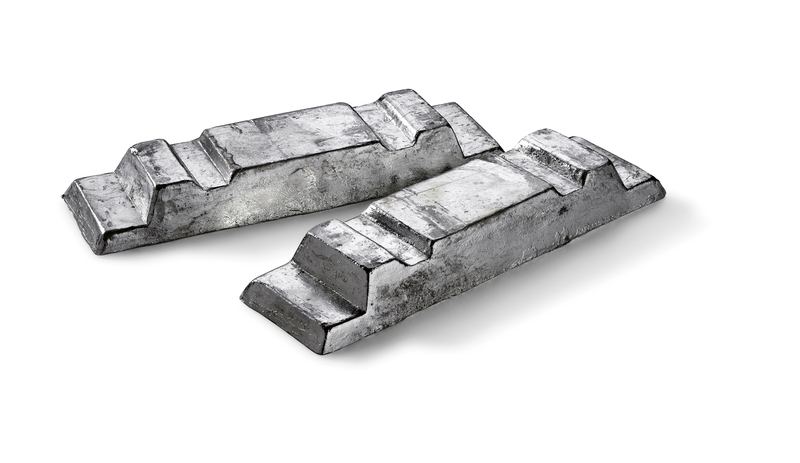 In many areas of Central Europe tin ore was separated with difficulty from other minerals through a mechanical and chemical process, and in order to transport easily, it was transformed into ingots and bars. At the end of the XVIII century, the extraction of tin from English and German mines was suspended as it was no longer cost-effective. Tin production subsequently increased in a significant manner in Malaysia, and, during the XIX century, on the Islands of Bangka, Billiton and Singkep (Indonesia); the centre of tin extraction moved back towards Asia. Among the most important sites for tin extraction, are Russia (especially in the areas neighbouring China), West Africa (Congo and Nigeria) and Bolivia, considered to be the richest deposit of tin in all America. Because of its various properties, tin has always been in demand. From a technical point of view, it has high resistance to chemical and atmospheric agents, it has a low melting point (232°C), it alloys easily with other minerals, and it has malleability and a bright colour. Pure tin, which is too soft for practical use, is hardened with small quantities of copper and antimony creating pewter. Pewter doesn’t oxidise like iron, nor turn green like copper, it doesn’t tarnish like silver nor is it brittle like pottery. “Once you eat in a pewter bowl you’ll marvel how pleasant it is, how easily food can be cut and how it keeps warm, while wine and beer stay cool when served in a pewter tankard”. As a result of the manufacture in medieval times of objects in monasteries, farmers started to produce all the items they needed. Some started to work wood while others became blacksmiths, according to their individual skills and soon they became craftsmen in their own right. The exploitation of tin mines led to a new profession: the caster. In Southern Germany, these artisans were called “Kandler” or “Kandelgiesser” (from jug = Kandel and to melt = giessen) while in Northern Germany they were known as “Kannenmacher” (from Kanne = jug and machen = to make, to manufacture). The first reference to Nürnburger casters, who created the first Guild of pewterers, dates back to 1285 and by the middle of the 14th century, Guilds and Associations began to spring up throughout Europe. In many cities in Germany and in other parts of Europe, however, there were communities of casters, some independent while others formed associations composed of similar trade categories. The art of casters soon gained respect and esteem. In the Middle Ages, the Guilds’ constitution was a fundamental part of common law. It contained the rights and duties of those belonging to a Guild, as well as specifications about a particular kind of job. The statute was first drafted by the elder Masters and then ratified by the city authorities. The ordinances included rules concerning not only the profession of the artisans (such as the composition of alloys and the obligation of a trade-mark) but also their private lives. One could only become an apprentice by proof of legitimate birth and the official recognition of being honest and devout. The apprenticeship lasted from 3 to 8 years and it was particularly hard; if the trainee “survived” this period, the Master set him a test before granting him the qualification of “worker”. It took many years to get all the necessary skills to become a caster and, once become a Master, he should be subjected to strict rules. The exam was held in the Master’s workshop and it lasted two weeks. The difficulty of the test was not only that the trainee should manufacture three objects using pewter, but he should also prepare moulds for stone, terracotta and brass. The objects he should produce during the exam were usually wine jug, bowls and ampoules.